Hello Darlings, To begin my romantic Blue Mountain getaway in style, our first couples activity after checking in at the Westin was to experience the famous Scandinave Spa. Unlike any spa I've experienced, the concept at Scandinave Blue is to place one in touch with nature. 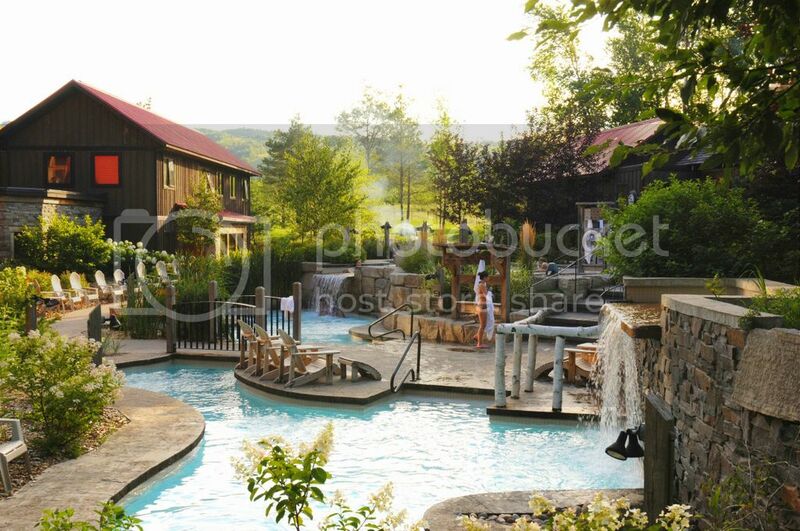 As the only Nordic spa in Ontario, the facility is surrounded by forests of birch trees and has magnificent scenic views of Niagara Escarpment. The ancient practice of baths dates back more than 3000 years B.C. and is attributed to cleansing the body, improving blood circulation and releasing endorphins. Leave a comment below telling me who your guest would be. The Scandinavian Baths Experience begins with a warm up in the Finnish sauna, eucalyptus steam baths or outdoor baths. This opens up the pores and begins the detoxifying process. I really loved the super steamy eucalyptus room! Then a plunge into a cold water pool. Yes, it is terrifyingly cold but so worth a try! This rinses the toxins from the skin and closes the pores. The plunge also increases the heart rate and enhances blood circulation throughout the body. The final stage is relaxation, which helps re-establish equilibrium as the body returns to a normal resting state. Relax quietly in a solarium, hammock, on a terrace or by an ondoor fireplace. I actually fell asleep in one of the hammocks! To enjoy the full benefits of the Scandinavian baths, repeat this sequence three to four times. Keep in mind that every body reacts differently to heat. Personally, I could only do the sequence twice as my body is not very tolerant of heat. Overall, the experience is amazing and very rejuvenating. It is a perfect way to spend the day! Please Note: Contest is open to everyone over the age of 19, does not include travel. The contest closes at 11:59 am Eastern Time on June 3rd, 2012. A winner will be chose by a random number generator.